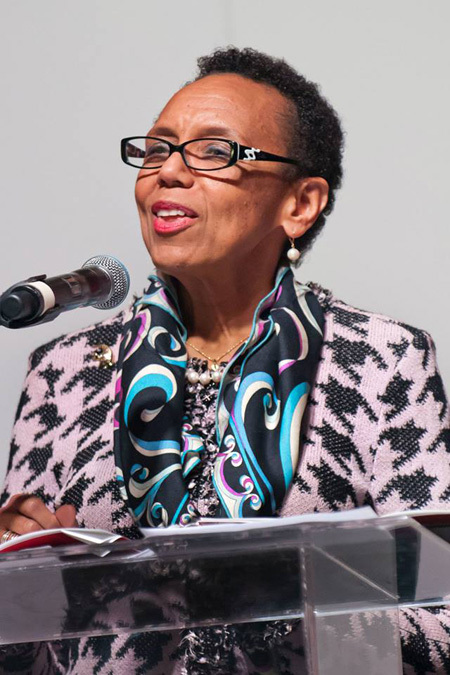 Senator Allyson Maynard-Gibson, Bahamas Attorney General and Minister of Legal Affairs, speaking at Barry University’s Distinguished Alumni Awards luncheon on Thursday, February 19, 2015. MIAMI, Florida – Senator the Hon. Allyson Maynard-Gibson, Bahamas Attorney General and Minister of Legal Affairs, was among seven noted alumni of Barry University who were honoured with the university’s Distinguished Alumni Award at a luncheon held at the Jungle Island Treetop Ballroom on Thursday, February 19, 2015. Held annually since 2007, Barry University’s Distinguished Alumni Awards recognize Barry alumni for their distinguished professional achievements and contributions to society through service. Senator Maynard-Gibson earned her Bachelor of Science in Business from Barry in 1975. At the age of 18, she was the youngest graduate in Barry’s history at the time. Guests at the luncheon, which also recognized Barry’s “Rising Star Recipients,” were welcomed by Mr. Matthew Blair, Associate Vice President for Alumni Relations and Annual Giving. Mr. Victor Oquendo, News Anchor for WPLG-TV, Channel 10, was the honorary host and the Rev. Cristobal Torres, a 2006 Barry alumni, gave an eloquent and inspiring invocation. In her remarks, Sister Linda Bevilacqua, President of Barry University and a 1962 alumni, congratulated the honorees for their distinguished professional accomplishments, contributions to society, and support to their beloved alma mater. 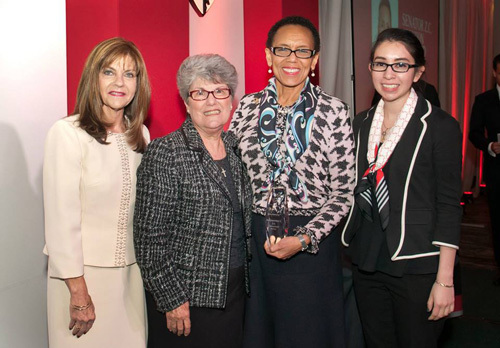 Pictured from left to right at Barry University’s Distinguished Alumni Awards luncheon are: Dr. Jill Farrell, Associate Dean for the Adrian Dominican School of Education at Barry University; Sister Linda Bevilacqua, Barry University President; Senator Allyson Maynard-Gibson, Bahamas Attorney General and Minister of Legal Affairs; and Barry student Sheila Perez. Other alumni honoured included Adriane Jackson, MSW ’12, Executive Director of Partners In Education; Joy Taylor, BA ’09, co-host of the Zaslow & Joy Morning Show and sister of former NFL All-Pro DE Jason Taylor; Mira Fuentes, BS ’01, a lifelong children’s advocate known as “The Mother Teresa of Miami;” Saima W. Hossain, BA ’97, MS ’02, SSP ’04, international advocate for children with autism, recent winner of the World Health Organization Excellence Award for Public Health, and daughter of Bangladeshi Prime Minister Sheikh Hasina; Nelson Lazo, BS ’94, Chief Executive Officer of Doctor’s Hospital in Coral Gables; and Maria Mas Blet, BS ’01, Managing Principal and CEO of GSK Wealth Advisors, Inc. Closing remarks were delivered by Dr. Sara B. Herald, Vice President for Institutional Advancement and External Affairs of Barry University. She admonished the alumni to continue their success and be proud about being a product of Barry University, support present and future developments of the institution, and share the BARRY-PROUD to the world at large.